I’d wanted a puppy for a long time. With my husband chiseling away at his evening MBA (which entailed driving to the other side of the state after work several times a week as well as some weekends), I was lonely. Though we both wanted to start a family, we were in a holding pattern until he had finished his MBA. A puppy seemed like the answer to my loneliness and desire to be a mom: he/she could keep me company and give me something to satiate my maternal calling. Rocco came into our lives in the form of an email from a coworker whose Lab had just had puppies – puppies they couldn’t possibly keep. It was love at first sight. All paws, he came bounding over to us, wagging his teensy nub of a tail and licking our hands. I scooped him in my arms and just knew he’d be our forever friend. Only eight pounds at the time, he was a little peanut who crashed in my lap on the long drive home – but you could just tell he was going to be all Lab: full of boundless energy. Little did I know that when we brought home our new, 6-week old furry bundle of joy, I had been growing my own bundle of joy for six weeks – which I wouldn’t discover for two more weeks. Yes. You read that right. 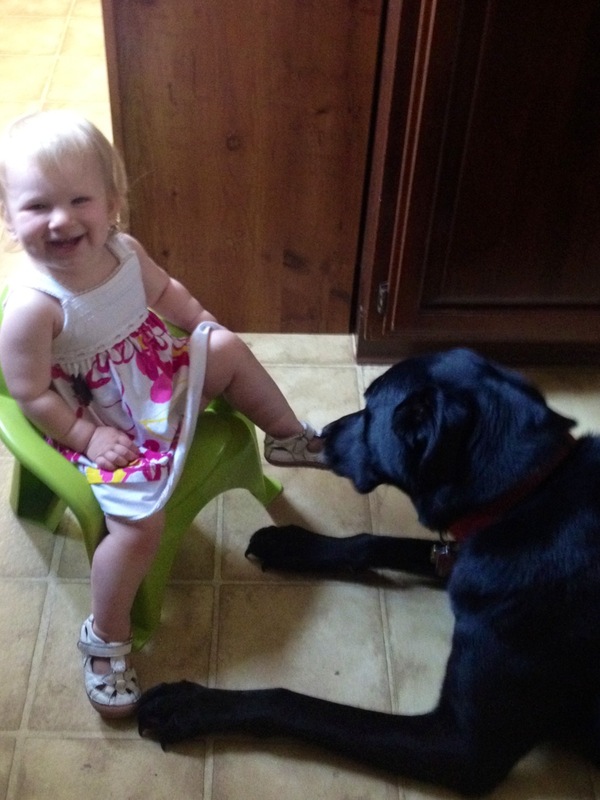 I was pregnant with our first child … and we had just brought home what would become a wild and crazy 105-pound puppy. How’s that for Murphy’s Law?! Though it felt daunting – and believe me, it still is at times – the more we got to know Rocco, the more I realized just how awesome he was at preparing us for the baby that was baking in my belly – the baby that would, in time, become his very best friend. Now that our daughter Maya is 18 months old, it’s easy to see just how well Rocco prepared us for her. While obviously dogs and babies aren’t exactly the same, in many ways, they are cut from the same cloth – and, as such, I’m very glad we went the “puppy-then-baby” route. 1. They are natural alarm clocks. It doesn’t matter if Rocco goes to sleep at 10 PM or 2 AM, he will still cry or nudge one of us to go out at 7 AM: like clock-work. Maya is the same way. She is up – every morning – at 7 AM. Even on weekends. The only time either of them really “sleeps in” is when they are sick — which isn’t a good thing for anyone. 2. They force you to keep a schedule. As soon as Rocco came into our lives, gone were the carefree day-trips to Chicago where we could come home at 2 AM or the impromptu overnight getaways. Unless we had a dog-sitter or had made arrangements with a kennel, we had to be home for him to go outside, go for a walk, and eat. This meant by the time Maya came, we were used to having restrictions on our days and evening. 3. They make a mess and you get to clean it up. I’ll never forget the day Rocco stealthily tore into a 1 lb. bag of sugar-coated jelly candies I’d gotten at a local Amish market and swallowed them whole, leaving only the twister tie and a part of the bag. He was four months old and the poor pup’s stomach couldn’t handle the candy: he threw up all night long … It got so bad that my husband ended up just keeping him outside and sleeping on the deck with him, calling the vet and giving him water and making him chicken broth. This was the first time I saw him as a “dad” – and it was pretty awesome. And babies … well … let’s just say, anyone who has ever dealt with projectile baby vomit or blow-outs knows all about messes. No need to even go there. 4. They both need to be toilet trained. We had Rocco using piddle pads when he first came home, but quickly shifted to just having him go outside every couple hours – which meant one of us needed to come home from work at lunch each day. Though training Rocco to go all day while we were at work without a potty break only took a couple months, it required patience, diligence, repetition, positive reinforcement and rewards. Potty-training Maya will be no different – except that training her will likely take a lot longer … and will require even more patience. 5. They can play the same game a hundred times and not get bored. I have probably thrown the same orange and blue ball at Rocco 900 times this weekend. Likewise, I have probably read Goodnight Moon 900 times and sang the ABC song 900 times. Now that Maya signs “more” for things she likes … we are on a never-ending cycle of her favorite stories and games. (Aren’t toddlers supposed to have short attention spans?!) What I’ve learned is even though I might want to move on to another activity, both puppies and babies will wait until they are bored to move on. 6. They get a lot of shots. The first year, Rocco had tons of well-puppy visits and got poked a LOT. This was good prep for Maya, as she endured tons of vaccinations in her first year (and beyond). Whereas a treat was all Rocco needed to forget each poke, Maya needed extra TLC from us after each well-baby visit. 8. They chew on furniture. Rocco has always been “mouthy,” but his mouthiness was particularly bad during my maternity leave (during the dead of winter). Let’s just say he engaged in some “attention-seeking behavior” to the tune of gnawing the hell out of the legs of our new dining room table. But this was a good learning experience because one morning we woke up to find little teeth-marks on the inside of Maya’s wooden crib. No, it wasn’t Rocco … turns out Maya had been rubbing her teeth up against the wood. And lately, she’s taken to chomping down on the fabric of our new couch for teething relief … Clearly, she’s over the whole frozen teething ring business, but I am not buying another new couch so we’re working on this. 9. They are your shadow. Rocco doesn’t like to be outside alone without us … if we let him go run around and play right after work as we’re getting dinner together, he’ll come to the door within minutes. (You’d think after lounging in the kitchen all day he’d relish the freedom of the great outdoors … not so much). He follows us around in true puppy form: whatever room we’re in, he wants in on the action — even if it’s just to lay at our feet or on the couch with us. Likewise, though she can certainly sit and play alone — and does — Maya also enjoys follows us around, mimicking things we do/say, wanting to be wherever we are. While it’s endearing now, I don’t think it will be so cute in a few years. And frankly I’d like to be able to have a minute in the bathroom without a visitor! 10. They both hear “NO” a lot … Poor puppies and babies. They do hear “NO” quite a bit. It’s not their faults they are just so darn curious! In their minds, the world should be theirs for the exploring … and then we meanie parents go and put up all sorts of barriers and set boundaries and put the kibosh on fun in the name of safety … Whatevs. So the chorus of “NO” (or, in Maya’s case, “No, thank you”) ensues. 11. They love to snuggle. Whether it’s the puppy asleep at my feet or Maya asleep on my chest, there is no greater feeling in the world than listening to one of them breathing close to me. Though he is a horse now, Rocco thinks he is a lap dog and when he snuggles up to me, it’s almost as though he remembers being that little puppy who nestled in my lap. And Maya snuggles … well, there’s nothing better. 12. They give unconditional love. Truly, the best and most awesome of the similarities. How about you? Did you have a dog first and then a baby, or did you wait to have a baby and then get a dog? What things would you add to this list? Glad to do it, Lara! 🙂 I think you’ll be very grateful for having had these experiences with your precious girls before little boy B comes! I think I’d still rather have another kid than a dog! It seems like so much more work to me!! Haha..well, other than the whole social, education, etc. 🙂 I know…I’m crazy! Hahaha … both are a lot of work, no doubt! But now at 2, Rocco is much calmer than he was before. The problem is now Maya is a full-fledged toddler, into everything, and his partner in crime. We can’t leave the two of them alone for a second!